As I pointed out earlier, there are many more skyship designs than the six presented in the previous article. Today I’d like to focus on a Calidaran concept—at least its “alpha” version. A “beta” will be needed eventually, and you’ll discover why in a moment. 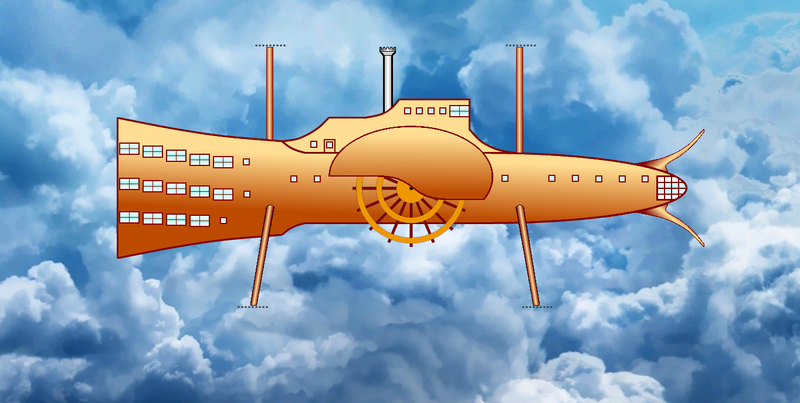 This skyship is not intended to appear in the upcoming book release. I present you the Spirit of Osriel. It is the result of an association between a human trader of Lorical and a dwarven engineer who’d emigrated to the merchant republic a few decades ago. Her Grace Felìcita Calitani, a prominent figure at the capital city, sought a vessel relying on winds as its main propulsion, but with a secondary device ensuring safe travel during adverse conditions. 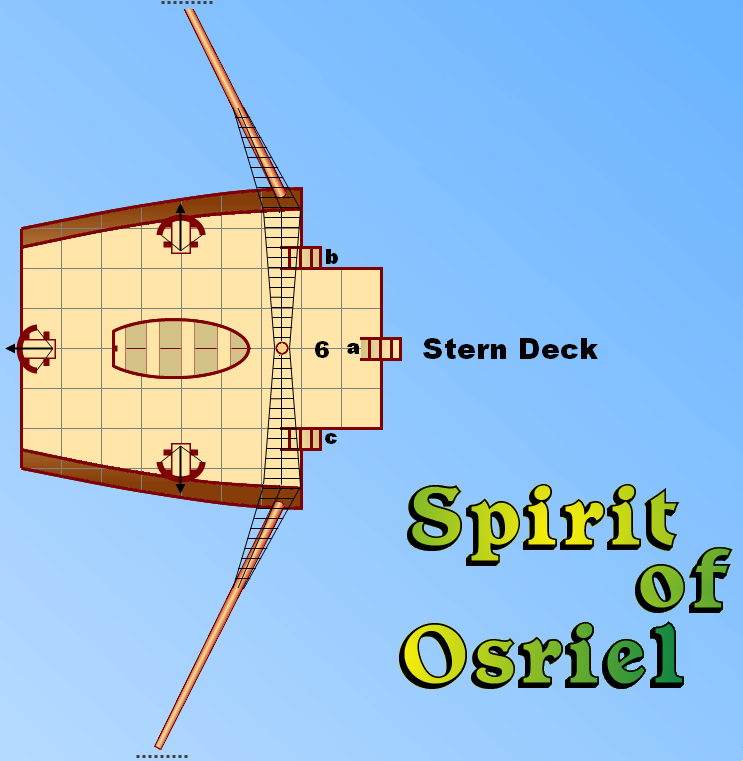 Thus was born the Spirit of Osriel, a steam-powered paddle wheel boat fitted with masts and an enchanted hull to make it airworthy. Its design flaws soon came to light, the first being the amount of space the dwarven-built engines required, along with their blackstone stores and water tanks. Freight capacity was therefore reduced accordingly. Regular supplies of blackstone proved expensive and unpredictable. With few sails, it couldn’t go as fast as dedicated sailing skyships. Yet the idea remained attractive. None of Felìcita’s competitors owned such a vessel, and the ability to reach a destination slowly but safely despite the Great Caldera’s fitful weather became an advantage to her and clients wishing to hire the vessel. 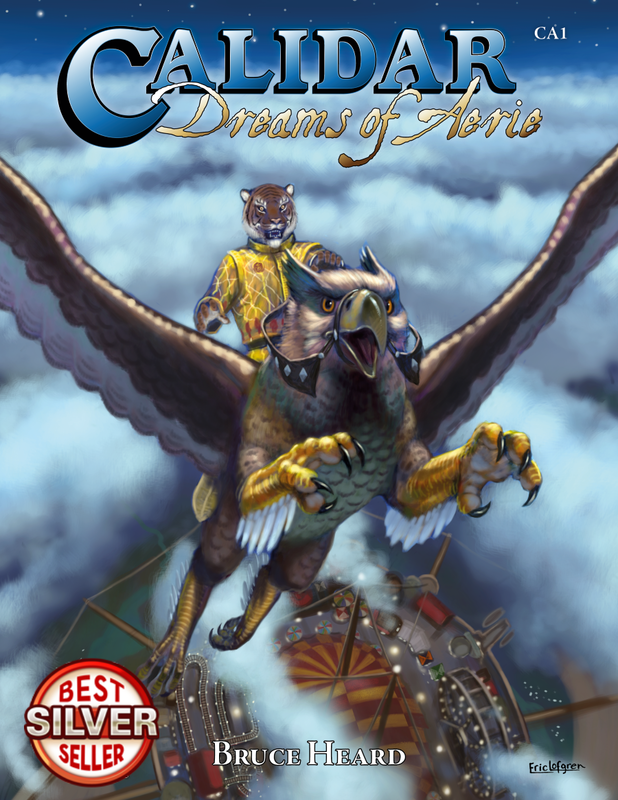 Sails luffing amid the clouds, masts creaking and groaning, funnels spouting sooty billows, and engines thumping faithfully below deck, the Spirit of Osriel specialized in carrying passengers as well as small but precious cargo. As a neophyte in ship design, I sketched out some rough ideas on paper and proceeded willy-nilly with the idea of drafting side, front, and top views. This was easier thought than done. First I traced a simple profile. The initial idea was to pull away from shapes suitable for a seagoing craft in favor of others more appropriate for airborne travel. The fore section therefore took the contour of an airplane’s nosecone. 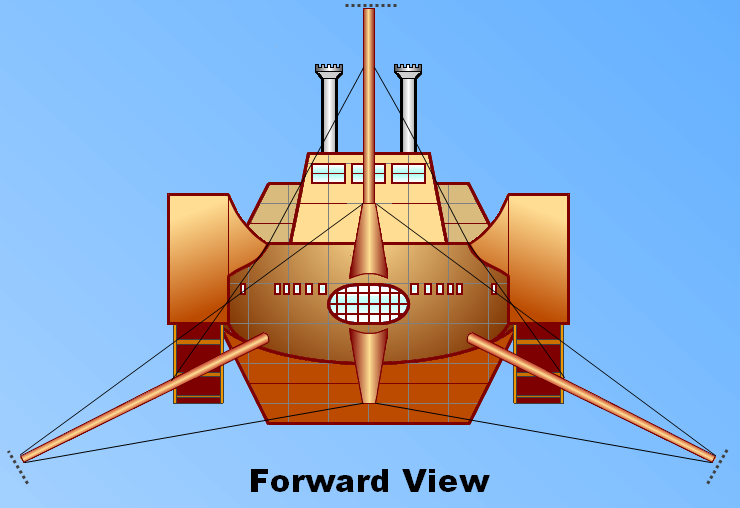 The midsection was to look like a paddle wheel vessel, and the aft section . . . well, that aft section was intended to differ somewhat from a galleon’s stern castle. We’ll get back to this later. Having accomplished this, I proceeded to add details. First came the paddle wheel itself. The idea was that the bottom part of the wheel trapped air as it spun (okay, it’s been enchanted to do this). The top part is shielded so it does not conflict with the bottom. Then came other external details. Before accomplishing this part, I had to think of where the various decks were located. The assumption was that the engines sat between the large wheels, with the smokestacks standing above. While doing this, I had to keep track of the front and top views. I then added the masts. Click on the illustration above to enlarge details. I ended up with two pairs of masts angled downward from the hull and a third pair upright. Lower masts extended fore and aft of the paddle wheel—a fateful decision if ever there was one. This arrangement is clearest from the front. The top view shows the shape of the fore and aft decks, the actual angles of the masts, a few weapons, and a rescue launch. The aft deck curves upward toward the stern. Once the outside was at least approximately drafted (more corrections followed), it was time to think of the sort of crew working the skyship, and available amenities. 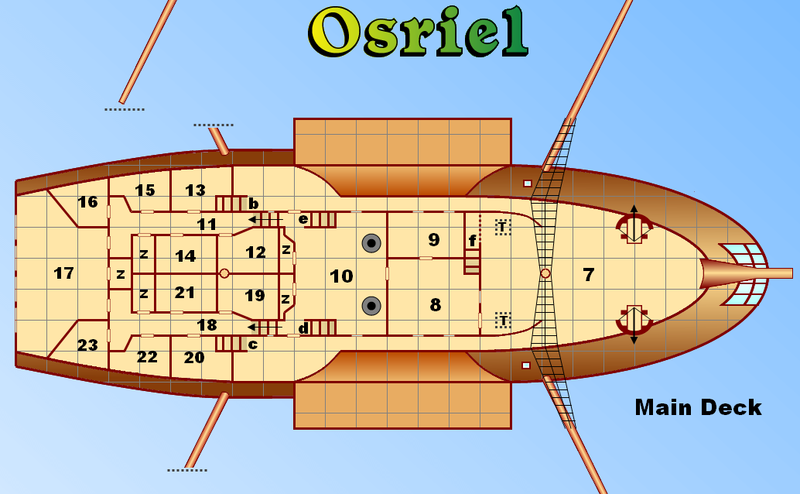 Based on historical ship designs, I knew that officers’ bedchambers were at best cramped—and cramped they are aboard the Spirit of Osriel. Junior officers may actually share their personal quarters with other fellows, allowing for two bunks in some cabins, one atop another. Rare are private chambers exceeding 10ft across. Common sailors pile up in the forward anchor room, hooking up their hammocks one above another in every possible corner, or sleeping on bedrolls on the deck—not exactly the most comfortable accommodation. At least they have their own heads. Officers don’t even have this “luxury”—for them the standard operating procedure demands chamber pots to be emptied though the portholes. The upper deck is reserved for officers and crew assigned to the bridge. In Area 3, you’ll find a ship’s steering wheel, various levers used to control the ship’s altitude, roll, and pitch, and navigating instruments. The main deck is fitted with artificial gravity, which exerts vertical attraction on what lies above, and pushes away what lies below. While traveling in space, a protective life bubble surrounds the ship. It stops just under the smokestacks’ top edges, which are fitted with valves, venting noxious engine fumes outside the bubble. The chart room lies behind the bridge, with a small shrine across the passageway. You’ll discover in the upcoming book what this is really about. The stern deck (Area 6) is reserved for passengers, officers, and sailors who need access to the aft masts, the launch, or the deck’s weapons. Hopefully, wind does not blow from directly ahead (it rarely does) so that smoke does not befoul this deck. Wind is much more likely to blow abeam or at an angle from astern. During the summer or in southern climes, a white tent likely covers this section of the ship. Stairs b and c connect with the main deck below. The main deck’s forward section (Area 7) is the realm of common crewmembers. Just past the forward masts lie two trapdoors. These are chutes through which blackstones are dumped during resupply. Beneath lie the ship’s blackstone stores. An overhang under the wheelhouse protects a stairwell (f) allowing common sailors access to their quarters on the forward lower deck. Stairs e and d in the officers’ wardroom connect with the lower aft deck. A few aftward steps lead down to the officers’ quarters (directly astern). Junior officers share cabins to make room for valuable passengers. The captain often invites important guests for lunch or dinner in the great cabin. Less fortunate passengers are assigned bedchambers on the lower aft deck. Areas labeled “z” are used for stowage. The forward lower deck (Area 24) is the common crew’s sanctum. Though extremely cramped, this spot benefits from a wide windscreen at the ship’s fore. A large wheel lowers or raises anchors or mooring lines when a proper skyport isn’t available for docking. Anchors, which are secured to the aft bulkheads, can be unfastened and eased through the trapdoors on the port and starboard sides of the crew quarters. The square blocks are sturdy structures locking in place the bases of the masts. Amidships lies the engine room (Area 25), with two dwarven-built motors, furnaces, boilers, water tank, and pipes connecting everything. The motors generate the power needed to spin the paddle wheels. As one might expect, this is a noisy, dirty, and smelly place. Right behind the engine room is the chamber holding the ship’s steering mechanism, which is usually controlled from the bridge. 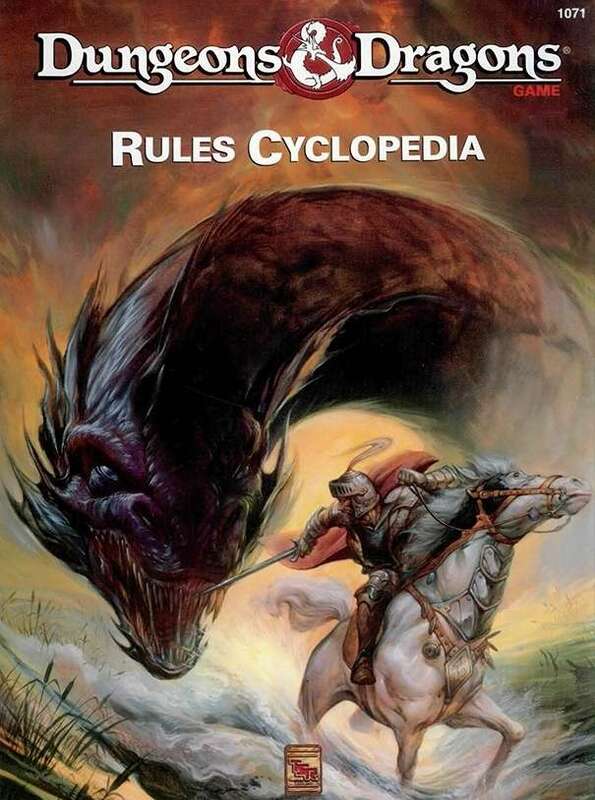 This and dwarven engines are explained in more detail in the upcoming book. Nearby stairs e and d connect with the officers’ wardroom on the main deck. A few steps lead down to the lower aft deck (Area 32). A complement of marines can be reduced to make room for passengers. Large double hatches astern the main hold can slide open to ease loading/unloading merchandise. A disassembled ballista is stored in this area. If room allows it, it can be reassembled and positioned to shoot out through the aft hatch. Stair g connects with the lower hold, just below (Area 42). However fascinating, the Spirit of Osriel’s present version features a number of flaws. The biggest one, which will require redrafting these diagrams, lies in the position of the masts and their sails. This ship’s forward upper sails currently block the view from the bridge. Making them permanently invisible could prove altogether needlessly expensive and terribly confusing to the crew. Sails on lower masts also lie directly before and after the paddle wheels, obstructing the airflow. The masts’ arrangement should be inverted. This would bring two pairs of masts rising in a V-shaped configuration from the starboard and port sides, and the third pair extending vertically, directly beneath the hull. Further modifications will include mechanical winches for controlling the bottom sails from the lower deck, as well as access hatches. On a personal note, I also don’t like the shape of the stern castle. It looks too much like a rifle’s stock This too ought to be updated to obtain a more interesting design. partial enchantment Sail speed adj. (*) Tonnage: It is a calculation inspired from real Earth's Builder Old Measurement system estimating a ship's freight capacity. It is only given here as a way to express relative hull strengths (given in points). Blackstone stores, steam engines, and boilers take up much of dwarven skyships' internal space. Sail Speed Adjustment: This is refers to maneuvering guidelines presented in the upcoming book. 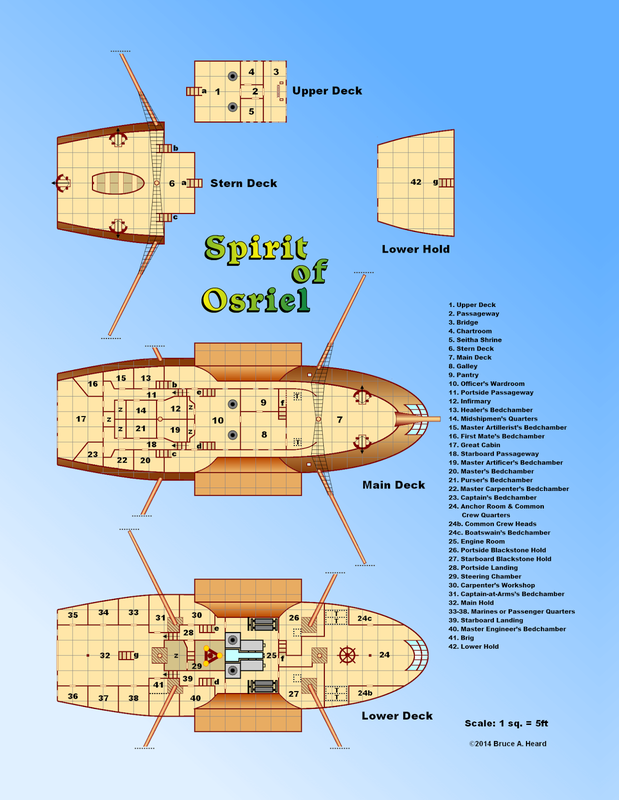 In short, the Spirit of Osriel sails more slowly than other sail ships when using wind alone. Its maximum engine speed is a flat 30 mph (20 kmh). If both sails and engines are combined, add half the sail speed to the engine speed. Sailing speed is based on wind strength and direction. 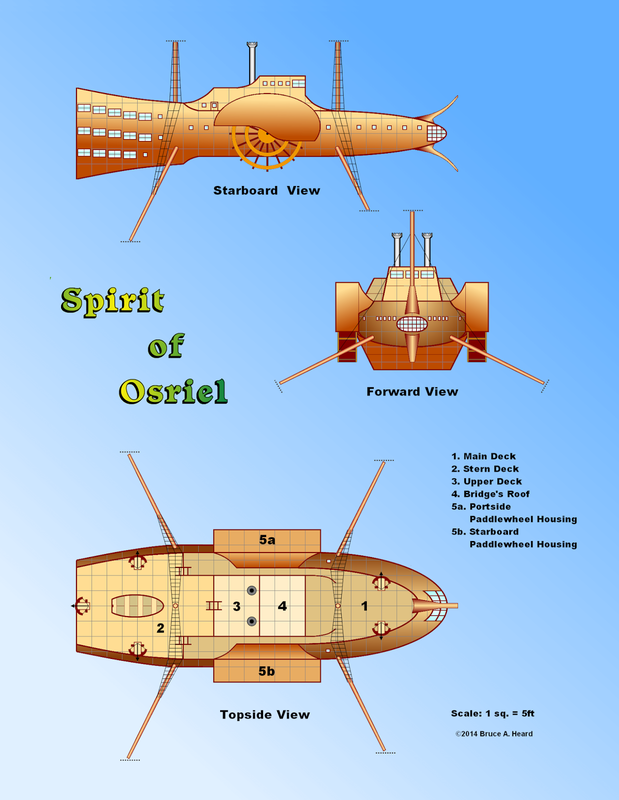 It’s back to the drawing board for the Spirit of Osriel Mark I. In the next article I’ll introduce an amazing skyship from the world of Lao-Kwei. Prepare to have your airman socks knocked off! Project Update: and by the way . . . the two poster maps have been printed. I expect to receive them by this coming Friday. The bookmarks and the cloth maps have already been delivered and look great. The book’s missing internal art is nearly complete, at last. Thorfinn is also working against the clock to vectorize the last few ship diagrams. By next week, the layout artist should start putting everything together.